On May 9, 2011 Dave Pebley’s motor home was rear-ended by a 10-wheel container truck after having pulled over to the shoulder following a flat tire. Mr. Pebley suffered, primarily, a neck injury that required a three level surgical fusion. Defendants disputed all liability for causing the crash, blaming Mr. Pebley’s wife, Joline, for not pulling over far enough onto the shoulder and Mr. Pebley himself for not wearing a seat-belt. Defendants also attacked Mr. Pebley for treating outside of his insurance plan and was accused of inflating medical bills. The case was tried by Sevy Fisher and Greyson Goody in Ventura County Superior Court. After just 45 minutes of deliberations, the jury returned a unanimous verdict in Mr. Pebley’s favor, awarding him $3,644,000. Defendants and their insurance carrier, California Capital Insurance, would appeal the verdict. They argued, primarily, that Mr. Pebley had a duty to mitigate damages by treating through his HMO rather than choosing his own spinal specialist. The Appellate Court affirmed the trial court’s decision, confirming what the plaintiff’s bar believed had been the rule of law: that a plaintiff that chooses to treat outside of their network on a lien is to be treated as an uninsured plaintiff for the purposes of determining reasonable and customary value of medical expenses and that evidence of the existence of health insurance is barred by the collateral source rule. 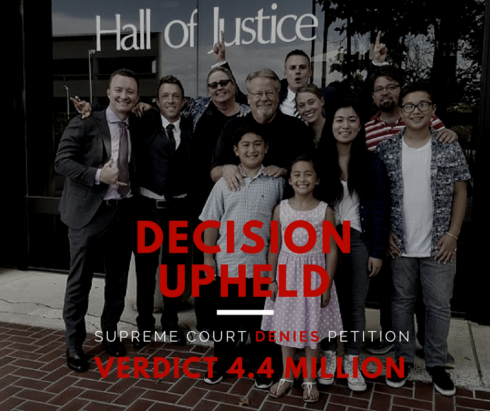 California Capital Insurance petitioned the Supreme Court to hear the case, however, that petition was denied.